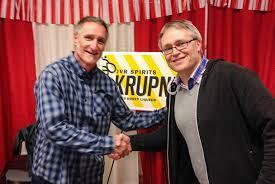 Krupnik is an ancient Polish liqueur which traces its roots back to the 1300's. As such, it has been a traditional drink in Poland for centuries. Despite its ancient pedigree, Krupnik's popularity has not faded in Poland, where it commands more than 10 percent of the liqueur market, according to a 1996 poll by the trade journal 'Rynki Alkoholowe'. The skillful combining of a century-old tradition with modern production methods has produced an excellent liqueur, best drunk warm in the winter or on the rocks during the summer. Krupnik (pronounced KROOP-neek), is made of natural wild bee's honey gathered in forests, and exotic spices. It has an outstanding honey-sweet taste and spicy bouquet with a strong, warming effect.